CHICAGO (CBS) - The Shedd Aquarium is throwing a lifeline to a sea lion that otherwise might be doomed. WBBM Newsradio's Regine Schlesinger reports, earlier this year, the Shedd lost Otis, one of its three sea lions, to cancer. Now, it's offering to take one of the animals that wildlife officials have been trapping at the Bonneville Dam on the Columbia River in the Pacific Northwest. Shedd senior vice president Jim Robinett said Washington, Oregon and Idaho have permission to kill any sea lions caught eating salmon at the dam. "You've got the Marine Mammal Protection Act protecting the California sea lions, but you have the Endangered Species Act protecting these endangered salmon that are milling at the base of the dam, before they find their way around it. 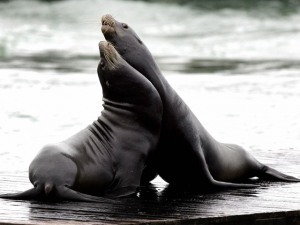 It's essentially a buffet for the sea lions," Robinett said. It's often their last meal. But, because the Shedd has a vacancy for a sea lion, it is negotiating to accept one of the captured sea lions, rather than have it killed. "They're always interesting animals, pretty active, and boy, when they start barking, you can hear it all over the Oceanarium," Robinett said. Nothing definite has been decided yet, but, the Shedd's keeping an eye to save the life of one of the doomed sea lions. Shedd Aquarium Looks to Adopt Sea Lion from Pacific Northwest <-- Listen at original site.